Our thrifty family eats a mainly real food diet. I won’t lie–there is the occasional corn dog and chicken nugget found in my home. I would say we follow the 80/20 principle, as in 80% real food and 20% not so real food. Real food isn’t as expensive as some may think it is. In fact, from casually observing the totals of those in front of me in the grocery store checkout line with carts mostly full of not so real food versus my grocery total for my cart of mostly real food, I often have a smaller total. 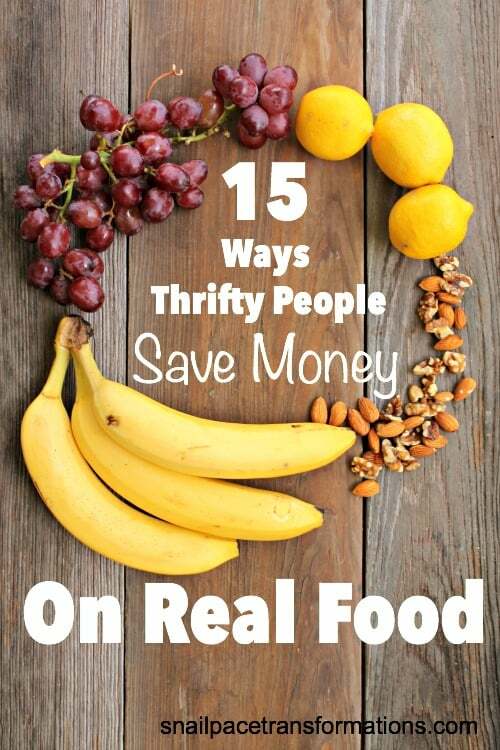 Yep–eating real can be thrifty! It takes me less than 10 minutes each week to plan a menu and perhaps another 10 minutes to make a grocery list. Those 20 minutes save me a substantial amount. First, I don’t waste food that was bought and never used. 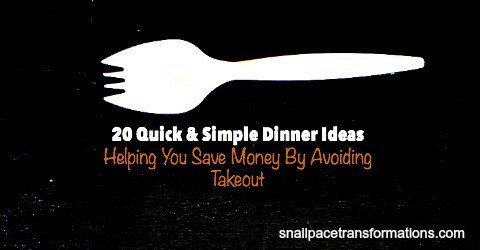 Second, we have a plan for dinner so we eat out less. Third, we shop our cupboards first and the grocery store second. A price book is a real food bargain grocery shoppers best friend. I will admit that I rarely carry around my price book anymore–mostly because once I set it up I then knew what type of foods were cheapest where and therefore didn’t need to carry it. However, I do like to dig my price book out now than then and check if item prices have changed significantly at certain sources, requiring me to switch stores. Yes, it is true that coupon apps offer a lot of rebates for processed foods, but they also offer a small selection of real food rebates and then there are apps that simply offer you a cash back on your entire receipt no matter what you purchased. I am not one who does a lot of traditional freezer cooking. Instead I tend to stock our pantry, fridge and freezer with ingredients that can make quick and simple dinners. These are great for activity filled nights where takeout is tempting yet expensive–and rarely real food based. These are dinners such as scrambled eggs and toast or tuna melts with tomato soup. Certainly not gourmet, but they fill tummies in a hurry. 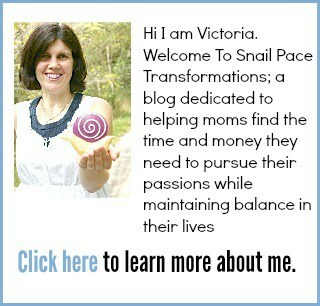 Now, you don’t have to make everything from scratch but making some will certainly save you some serious cash. In our family, for instance, we bake a lot of our own buns and dough for pizza using our bread machines. We also bake most of our own baked goods. Real foods are available at more places than just your grocery store chain. For instance, I have found a great selection of whole foods a Big Lots for cheaper than my local grocery store. If your town has one, I have heard people saving money on real foods at small ethnic grocery stores. You don’t need a huge yard to reap real food benefits from a vegetable garden. Our yard is small and yet ever year we grow more tomatoes, beans and cucumbers than our family of five can eat–and we are just using a very small area of our yard. Real food often expires fairly quickly so it can frequently be found with markdown stickers on it all around your grocery store. Our family has benefited from these mark down stickers recently for grass feed beef, saving $1.50 per pound on 8 pounds, making our total savings $12. Since ground beef is easy to freeze, picking up this type of real food mark down is a no-brainer. Other real food markdowns are not as simple to decide if they are worth it. Since the item is usually marked down because it is very close to its expiration date you need to be able to use it fast. Therefore don’t buy real food markdowns if you can’t think of a way to use it up right then and there (excluding items that can easily be frozen for later use). It seems to be Murphy’s law that the more trips to the grocery store, the more impulse items you come home with. Few are able to completely avoid impulse items all together. Therefore the fewer times you visit the grocery store the fewer chances you have of purchasing something not on your list. Another great way to combat this tendency is to make it a rule that you take a look in your cart as you are about to approach the checkout and take out at least one item. Making this a habit will save you from many an impulse buy. (psst…I learned this tip from my friend Cherie Lowe in her book Slaying The Debt Dragon). I worked it out one time and our family saves enough on yeast each year by buying it at Sam’s club instead of in the grocery store to pay for our Sam’s club membership for the year. That’s just one whole food item we buy at Sam’s. Over the course of a year we buy dozens of items and save way more than the membership price. Many real foods are available in the frozen section for a substantial discount over fresh, especially if it is out of season. Frozen foods are often flash frozen, which means they are frozen shortly after they are picked, locking in the nutrition of the vegetable or fruit. Our family used to throw away a lot of spoiled fruits and veggies bought to snack on until I started cutting up our fruits and vegetables right after I returned from grocery shopping and placed them in see-through glass containers with lids and started storing them in one simple to access area. Confession: lately I have fallen out of the habit of soaking beans overnight and then rinsing them and placing one to two cups full in a freezer safe container to use for meals later. Not only does this habit save money, it also is generally healthier for us as many canned versions of beans contain added sodium–plus there is the whole BPA issue with can foods. So I understand that life gets busy and canned beans become easier than dealing with dried, but it really is pretty simple and quick to soak and freeze beans–honestly it is, google it. Now I need to just get back to doing it myself. If your town has a farmer’s market, attend it regularly and you will find some great local fresh food for less than you might find at the grocery store. Joining a local CSA if your community has one is another great way to get fresh foods for less. 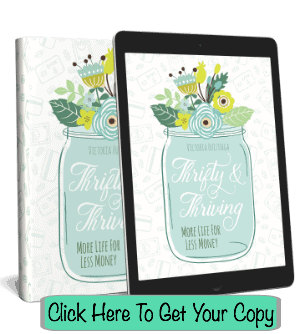 This is my number one thrifty tip for all those wanting to become thrifty ninjas no matter what area of finances they are trying to save money in: become a life long learner. Never stop reading and researching from those who know more. One great book that is full of way to save money on your groceries is Cut Your Grocery Bill in Half with America’s Cheapest Family: Includes So Many Innovative Strategies You Won’t Have to Cut Coupons. 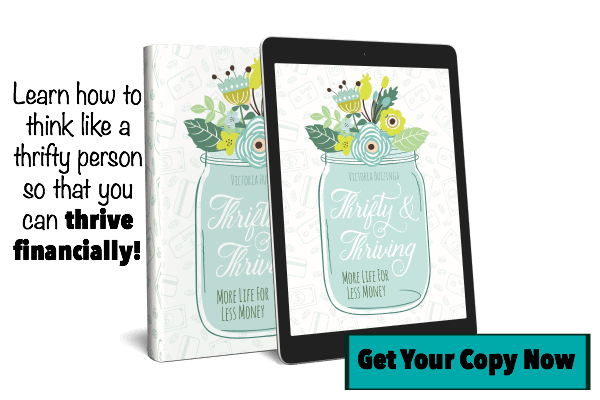 Most of the money saving tips in the book can be applied to real food very easily.